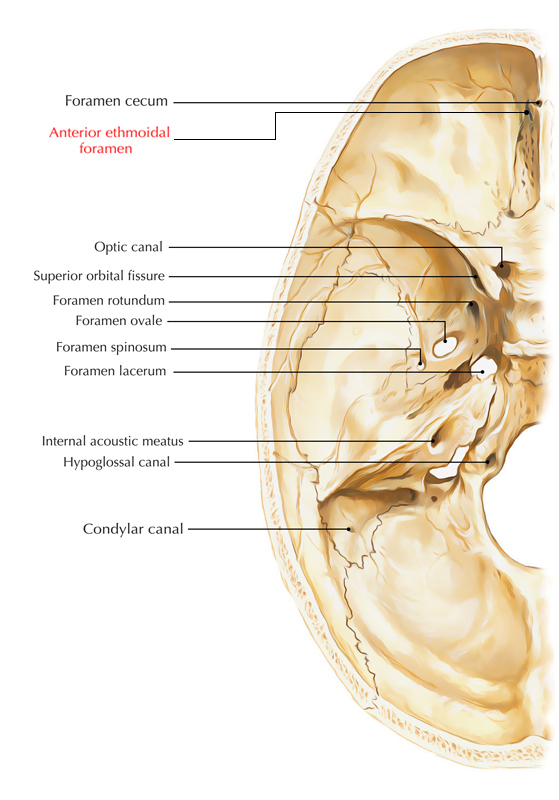 A small aperture known as the anterior ethmoidal foramen is found within the skull in the ethmoid bone. It is considered as the anatomical boundary of anterior and posterior ethmoid air cells that are found in this area. 5 cm from the lacrimal crest. 2 cm anterior towards the posterior ethmoidal foramen. The foramen conveys the anterior ethmoidal nerve inside the anterior and middle ethmoidal sinuses along with nasal cavity; it is a division of the nasociliary nerve. Occasionally, the creation of foramen takes place inside the orbital plate of the ethmoid bone. Anterior ethmoidal notch on the superior margin of the ethmoid bone. Small indentation in the frontal bone which creates a small foramen in the sutural connection among the two bones.